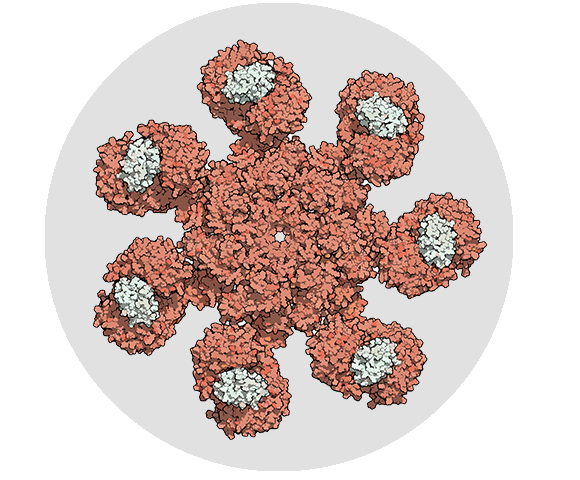 The apoptosome is a protein complex formed when seven Apaf-1 molecules oligomerize and recruit the protease caspase-9. The apoptosome is part of the mitochondrial or intrinsic death pathway and forms when cell stressors, cellular damage or other signals trigger the release of cytochrome c from mitochondria. Cytochrome c binds to Apaf-1 and induces a conformational change that allows Apaf-1 to self-associate into a wheel like complex, with caspase-9 binding at the hub of the structure. When bound in the apoptosome, caspase-9 is activated, an event that triggers a cascade of protease activation that can ultimately kill a cell by apoptosis. Small molecules that Inhibit Apaf-1 are reported to improve outcomes in models of ischaemic tissue injury and to reduce cisplatin induced ototoxity. Activators of Apaf-1 are predicted to be potential anti-cancer agents and while this type of molecule has not yet been identified, small molecules that sensitize Apaf-1 to cytochrome c mediated activation show activity against cancer cell lines.